The vast majority of photos of the Machu Picchu Historical Sanctuary present impressive images of the mountains that surround the Inca City of Machu Picchu, with peaks as iconic as the archaeological site itself. In the surroundings of Machu Picchu, we can find important archaeological sites among which we can mention the Intipunku or Puerta del Sol, the Temple of the Moon and the Levadizo Bridge or Inca Bridge. For the visit to these places, it is necessary to count on a lot of time and with experienced guides who know the zone, since its route has impressive abysses; And some of its Inca roads will show you its dangerous side especially if your visit takes place during rainy season. Located 1 km southeast of the Inca city. It corresponds to the settlement that protected the city, contains liturgical altars, covers constructed at intervals, called “ritual stations” by Bigham. With environments and floating walkways, formed by platforms that emerge from one side of the mountain. This route represents a certain danger due to its geographic location. The road to this Inca construction begins at the Ten Vain Campus, located south of the City of Machu Picchu. It is a narrow path, deliberately made on the side of a mountain of rock. It covers approximately two kilometers, in one of the curves the bridge is interrupted giving rise to a great precipice, where the Incas decided to construct a drawbridge based on trunks of trees, these fit perfectly in the built-in endiduras, so that Would not be inconvenient to remove them. It is an extraordinary Inca construction, of short extension, surprises its fine finish and amazing location. It is an architectural site on the north side of Machu Picchu; To enter you have to buy the entry ticket Huayna Picchu. Sculpted inside a natural cave, with niches and false doors embedded in the rock, has a gigantic entrance (8 m high and 6 m wide). It is believed to have been a royal tomb, a shrine, as well as a lookout. 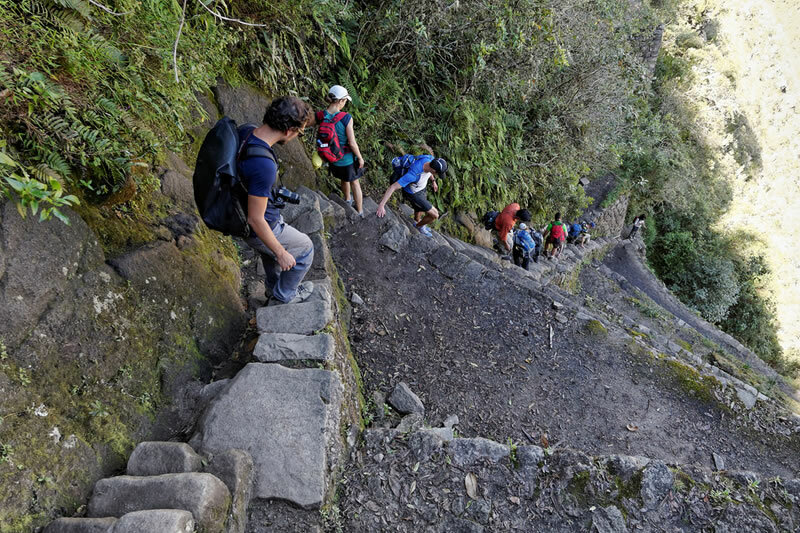 Trekking through areas full of history and culture, has made each year more people decide to have this type of adventure, it is possible to see every morning, queues of people, eager to be one of the 400 people who obtain permission to ascend the most Of 2,693 ms of height that has the top of the Huayna Picchu. They come in groups of 200, the first group is between 7 and 8 hours, which allows the second group to be between 10 and 11 o’clock. The trek to the top of the Huayna Picchu is approximately 2 km long. The path is quite steep, has some sections where hand ropes are needed to balance by very narrow paths, with gulfs that produce vertigo. Another excellent alternative in case you enjoy trekking although less popular, is hiking through the Machu Picchu Mountain. It is a peak on the opposite side of the archaeological zone, which can be accessed following the last section of the Inca Trail in reverse, by a path that will lead you to Sun Gate (Intipunku). The trek to the mountain Machu Picchu allows a maximum of 800 people per day, is separated into two groups of 400 people with incomes of 7 to 8 and 9 to 10 hours, but unlike Huayna Picchu that can only be accessed Reserving weeks in advance, this is almost never filled, at least for now. In the mountain Machu Picchu, you will have long periods of time without seeing anyone, something very rare in the area of Huayna Picchu, where there are stretches that have to be used in turns, by the large number of people who venture to this mountain. The Machu Picchu mountain does not have archaeological sites like Huayna Picchu, but this is compensated by a landscape accompanied by wild orchids and birds that highlight the road. Where can I get my own classic Machu Picchu postcard? There are many visitors wondering how to get their own classic Machu Picchu postcard, with the Sanctuary in the background and the surrounding landscape. Questions about the exact place to take this photo and if necessary ascending to some of the mountains, in order to obtain this photo. We give you the necessary information so that you can get your photo postcard with the entire Inca City of Machu Picchu without problems. It is true that he should walk to get to the point that allows him to take this photograph; However, the section is not long or tired, it does not have to ascend to any of the mountains, you just have to get to the “House of the Watcher”. Getting to the “House of the Watcher” does not represent any difficulty, nor does it require too much physical effort. The first thing to do is to arrive at the Archaeological Sanctuary of Machu Picchu, regardless of the route you have chosen to enter, after the tour of all the sites and attractions you can visit take your time to climb to the “Casa del Vigilante” where You will finally get the classic photograph, with you surrounded by all the splendor of the Sacred City of the Incas.